In fact, the treadmill has so many uses and so many benefits that many people want to buy it. For better or for worse, this is also one of the reasons why it is the most saturated categories in the fitness equipment industry. And also the reason why it’s difficult to choose the right product for the right price. Below are some helpful tips to give you some idea on what to look for in a treadmill and basically how to buy a treadmill online. The first concern you should have when shopping for a treadmill is your goal. Why are you buying a treadmill? Is it because you want to be able to keep up with your running routine despite the weather? Or is it because you prefer running indoors than outdoors? Consider how often you will be using your treadmill. If you are only going to use it occasionally, then you might be better off with a treadmill that comes at a decent price. Also, consider other potential exercisers in your home. Most families will have more than one individual that will likely be using the treadmill. If your family is one of these, then make sure that your treadmill answers their exercise needs as well. When shopping for a treadmill, it is important that you consider the reasons why you’re buying a treadmill in the first place. Under-buying or buying a low quality, under-powered treadmill that doesn’t meet long-term needs of all users in the household is a mistake you won’t want to make. However, if you are indeed looking to buy a treadmill, chances are that you have already done a lot of research on your own. In fact, you probably already know which features you want in a treadmill. But if you want a good deal that won’t turn sour in the long run, another consideration you should have is not all treadmill brands are the same. The obvious choice would be Choice 1 because, as all treadmill buying rules state, you should choose the treadmill that provides more motor power for less. But you shouldn’t limit your choice to that single consideration alone. You cannot make a buy based only on motor power, since that may not be enough of a guarantee that the treadmill is a good buy. It is quite possible that Choice 3 is the better choice, considering that Brand Z has a reputation for delivering quality treadmill with extensive warranties. Although motor power is a good feature to consider when buying a treadmill, you have to be careful. Look at it in the context of the whole treadmill, including even the brand. Another important tip in treadmill buying is don’t always believe what the salesperson tells you. Of course, we’re not saying that salespersons are not to be trusted. But in this day and age, it’s a smart buyer who gets everything in writing first before committing to anything. After all, salespersons can make mistakes, too, and sometimes these mistakes can end up costing you. The last consideration that you have when shopping for a treadmill is the price. When we say price, we don’t mean the amount indicated in the price tag. In fact, forget about the price tag all together and look at the real price of the treadmill. There is no doubt that price is one of the most important factors when buying a treadmill. But sometimes, as you have probably experienced before with a completely different product, price can be very misleading. So when you buying a treadmill, don’t base your decision on the price tag alone and consider everything else about the product to determine its real price. What’s in the treadmill motor? Perhaps the most important component of the treadmill is the motor. In fact, as stated earlier, most people tend to base their decision in determining good treadmills on motor power. So what’s the deal with a treadmill’s motor? One difference in treadmill motors, which isn’t always reflected in the product literature, is whether the manufacturer lists horsepower in terms of “continuous duty” or “peak performance.” A manufacturer may be able to get a motor to operate up to 2 HP at peak-performance levels, but that doesn’t mean that it will perform at 2 HP consistently. Some manufacturers actually claim that they’ve got a 1.5 HP motor, but when you push it, you find that the motor can actually reach up to 2.5 HP at peak level. If you’re on a budget and want a very inexpensive treadmill, our suggestion is you buy a treadmill with a manual motor instead of an electric. The reason is simply that manual ones are less likely to break down. However, the downside to this buying choice is that manuals have the disadvantage of being slower and more difficult to operate because the user powers the belt. And so, if the exerciser begins to tire and slows down, the belt slows down, too. On the other hand, the belt of an electric model continues at the same speed, motivating the exerciser to keep going as well. Treadmills vary according to the type of features they have. 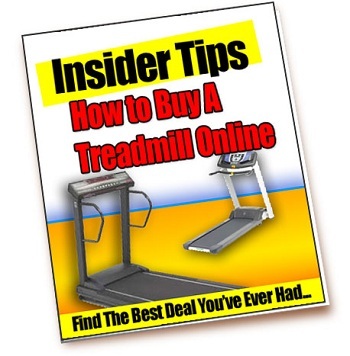 Knowing what these features are can help you in buying a treadmill, whether online or offline. •	AC or DC motor – Most home treadmill units are DC. Commercial treadmills may have either AC or DC. AC treadmills will likely require a dedicated power line, considering how their motors tend to draw more power. Not only that, AC also tends to be noisier than DC. •	The thickness of the running belt – Admittedly, you cannot maintain a straight line while running. If that were true, you can just go ahead and run on a balance beam, six inches wide. That is why the thickness of the running belt is an important feature to consider. In addition, two-ply belts are stronger and less likely to curl at the sides than one-ply belts. •	The length of the running surface – Next to the thickness is the length. If you are a taller than average person, you might need more running surface for you to make sweeping strides on your treadmill. On the other hand, if you want to really challenge yourself with short, brisk strides, then get a treadmill with a shorter running surface. •	The minimum and maximum speed – Ask yourself whether you’ll be using your treadmill for walking or running. Treadmills for walking start at 0 or .5 and go up to around 6 or 6 mph, while those for jogging or running generally start at 0, .5, or 1 mph and go up to 8-12 mph. •	The percentage of incline – It can range from a low of 2-4% to a high of 15%. The general rule is the bigger the better, but there are exceptions to the rule: Not all treadmills with high percentage of incline are good buys, especially if you take in all the other features of the product. Commercial-grade treadmills often go as high as 25%. •	The type of incline adjustment – The most high-tech incline adjustment is the automatic incline. This type of incline changes depending upon the exerciser’s heart rate, sometimes via a wireless monitor that detects the person’s heart rate and automatically adjusts the percentage of incline to keep the person within the target heart range. Other treadmills have electronic inclines that can be altered by pushing a button on the console, while less sophisticated ones have either a manual hand crack or other manual adjustment that has to be set before starting to exercise. •	Electronic feedback displays of speed, time, and distance – On most treadmills, these are generally standard, but some treadmills have added a few extras in their feedback monitor. For instance, some treadmills can display the number of calories burned or the user’s heart rate. In addition, most treadmills offer preset and/or customizable programming capabilities. This is a pretty nifty feature to have since you can now design your own program with the use of the customizing capabilities of your treadmill. •	Emergency Shut Off – Usually, these are magnets or buttons you yank or push to cut power instantly. This is very efficient if you get into trouble on your treadmill. •	Hand Rails – I know. Who wants to get hampered, holding onto a rail while running? Well, consider what the hand rails are for, first, before you dismiss the notion. You need at least one just for safety and balance. If not, then at least get one with a slightly extended front rail. •	Cushioning – How much is based on personal preference. This is for less impact and more comfort with each foot strike you make. •	Safety Lock or Switch – This is advisable if you have kids who love to fiddle with things and accidentally start the machine. •	Warranties – At least one year manufacturer’s warranty on parts and labor. Most companies these days offer various levels on frames, motors, parts and labor that vary from 1-5 years, with some even offering more than 10 years or limited lifetime. Check on the limits, though. • Incline adjustments that require you to dismount and move pins or other mounts on a support leg. This is very inconvenient and could even affect your exercise routine. •	Non-motorized models. They are a strain on joints and muscles and mean irregular speeds since you can’t “pull” at a steady pace with your stride, especially if you run where you spend a few milliseconds on every stride off the belt in the air and obviously not able to pull. And there. As long as you keep these valuable tips and advice in mind as you shop for a treadmill online, there is no reason why you shouldn’t end up with a product that turns out to be the best deal you’ve ever had.